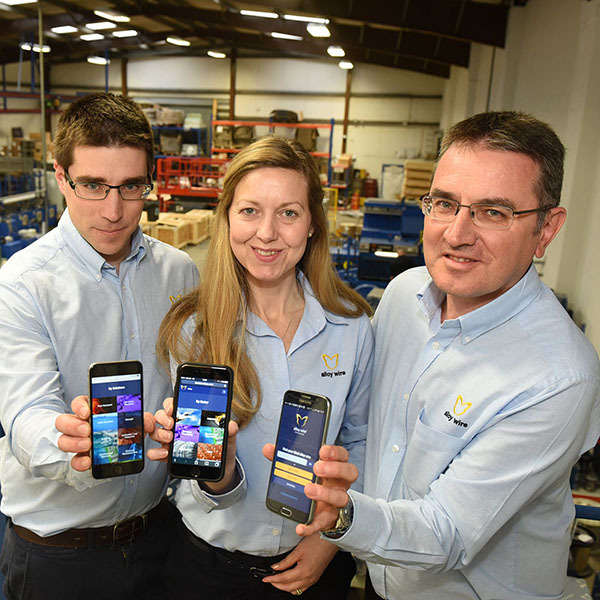 One of the world’s premier suppliers of wire in ‘high performance alloys’ has launched a new ‘app’ to help its global customer base find the right material for their applications. Alloy Wire International (AWI) has spent the last four months developing an interactive database of all of its materials, their properties and their applications and this is now available on computers, mobile phones and tablets. The web-based app, which has been developed by technical experts, allows users to search for the type of wire they need by industry sector (e.g. aerospace, oil & gas and nuclear) or by application solution, such as high strength, sub-zero temperature, heat, corrosion and water resistance. “We’ve got over 60 different nickel alloys in stock at any one time and we need to make sure our clients get the material that best suits their manufacturing requirements. The app will help them do just that,” explained Mark Venables, Managing Director. Alloy Wire International, which makes round, flat, shaped profile and electrical resistance wire, is planning to translate the ‘Wire Finder’ app into a range of other languages to support its export drive. This has seen the company supply into more than 52 countries, with the latest destinations to request AWI wire being the Dominican Republic, Nepal, Peru and Oman. “About 50% of our sales go overseas and this is a figure we believe will increase as we look to increase the number of international staff and the exhibitions we attend,” added Mark. Just click on ‘New Wire Finder App’. You can then add it to your home screen on your iPhone or Android.